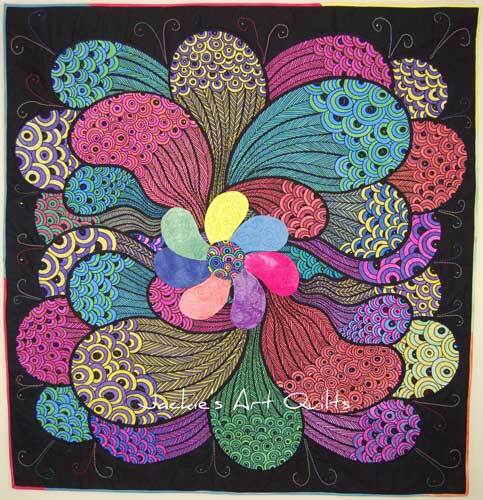 I am Jackie White from Jackie’s Art Quilts. I live on Manitoulin Island, Ontario in a small town of 500 with my husband, two little boys 7 and 8, and our giant standard poodle. I started quilting 12 years ago and can’t believe the opportunities I have had, and friends I have made along the way. I call myself an art quilter. Every quilt I make has some type of 3D embellishment on it and I love coming up with unique three dimensional items to add to my quilts. 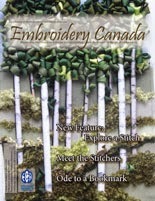 I was once told that my methods might be ‘too out of the box for Canadian quilting’. I disagree, Canadians are awesome at accepting everyone! The quilt, ‘Ripple in Time’, was juried into the 2012 National Juried Show in Halifax. Hours and hours were spent coloring fabric with fabric markers, then cutting out the shapes and assembling. 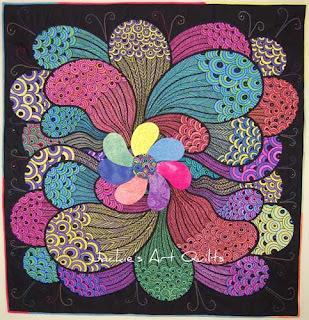 Embroidery swirls on the outside and many many hot fix crystals applied throughout. I have just joined the Canadian Quilters’ Association (CQA/ACC) Board and am absolutely loving meeting Canadian quilters face to face. I write a humourous column for CQA/ACC in their quarterly magazine. You can see a few of my past articles here. 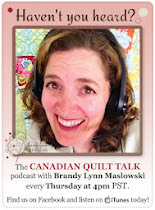 I am part of an amazing design team for Amanda Herring of ‘The Quilted Fish’. 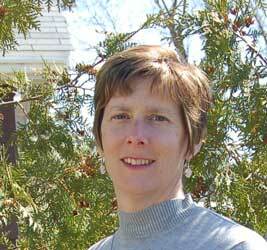 She is a fabric designer and pattern maker. 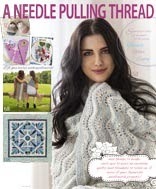 Amanda just published a book and featured a pattern from each of her team in it. My pattern was a fabric necklace. 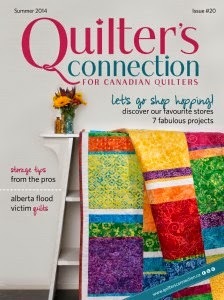 As for getting published, I was also featured in ‘McCall’s’ magazine this past May with a quilt pattern I designed. 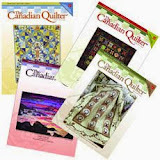 I work for Pellon Inc. and Riley Blake fabrics doing tutorials for their websites. The nest is three dimensional with a lovely blue stone in the middle and the nest is surrounded by couching eyelash yarn around border. 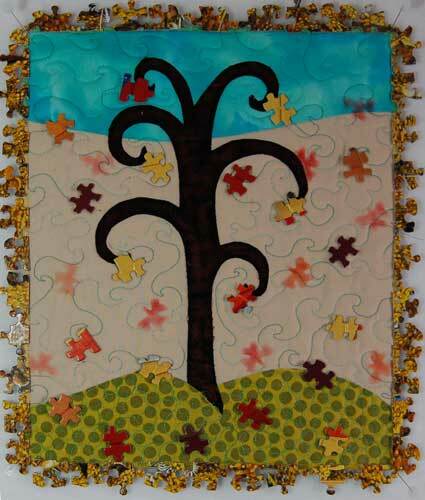 The background is a traditional pieced pattern with black ‘branches’ running throughout. Uses puzzle pieces as leaves and as a binding. Shiva stiks help create a colourful background. The thrill of entering juried shows is one of the reasons I quilt, not so much getting the rejection letters, (and I have A LOT of them), but the challenge and the joy of being accepted. I have started teaching workshops on my 3D art quilting and thoroughly enjoy encouraging quilters to try new methods and create quilts in a whole different way. I also continue to work hard at my blog to show my readers new and different things out there in the international quilt world and what I am up to. 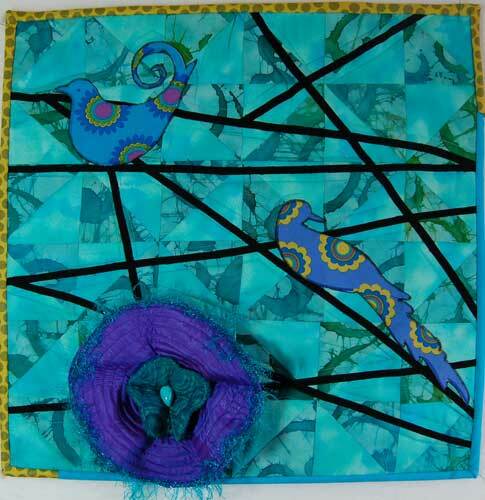 Future goals include teaching workshops in Canada on 3D art quilting and someday winning a ribbon at a juried show. My very favourite things about quilting are meeting fellow quilters, especially when I get the opportunity to meet Canadian ones, and continuing to create my 3D art quilts.